Dark Revelation Volume 3 is a combined reprint set in the TCG. 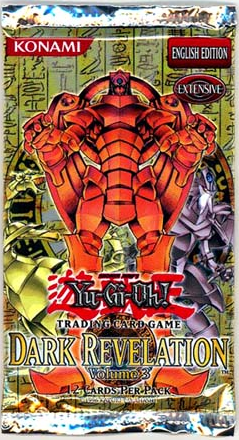 The OCG equivalent of this Booster Pack is Expert Edition Volume 3. The rarities duplicate exactly their parent sets, but do not include Ultimate Rares. This set was initially released only with the Ultimate Edition 2 Special Edition blister pack. Dark Revelation Volume 3 is comprised of cards originally printed in Soul of the Duelist, Rise of Destiny, Flaming Eternity and The Lost Millennium. This page was last edited on 30 December 2016, at 23:44.